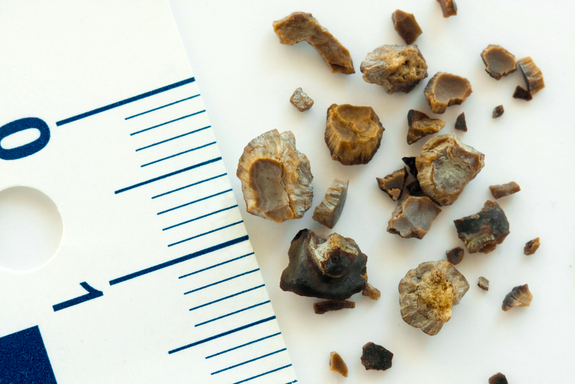 Kidney stones are very small pebble-like clusters of minerals and acid salts that accumulate in the kidneys. Their accumulation can have a negative effect on the kidney itself or even the urinary tract and bladder. Passing a kidney stone can happen on its own, eventhough painful, and would not necessarily cause any damage in the urinary tract. In some extreme circumstances, a person might need surgery to get rid of them. Preventing these Kidney stones are the best option; however, in case this step failed, here is what you need to know. What causes these kidney stones? Medications such as diuretics and Calcium-based Antacids. Hyper-parathyroidism (when the parathyroid gland embedded in your neck secretes too much hormones leading to an excess level of calcium in the blood. Lifestyle: several bad daily habits can lead to the formation of kidney stones such as not drinking enough water; eating a diet high in proteins, salt and sugar; and being obese. Very heavy pain, in your side and back& underneath your ribs, that spreads towards the lower abdomen. This pain would probably come and go in different intensities. Your urine might turn pink or reddish & would probably smell very bad. Nausea and vomiting accompanied by chills if there is an infection. What tests would determine if you have kidney stones? There are numerous tests that can detect a kidney stone such as a blood test to check your calcium and uric acid levels, a urinalysis to show if you are excreting a high level of mineral stones, an abdominal x-ray or even a CT scan (in some cases) that will show if there is a visible kidney stone. The treatment depends on the substance from which the stone was made and what the overall size of the stone. Some people might resort to home remedies while others will rush into their doctor’s clinic. Your urologist would pick the best option for you. Small stones are usually passed without any needed treatment. You might need some painkillers and to drink a large amount of fluids. Painkillers could be regular pills (like panadol or advil) or intravenous medications if the pain is unbearable. Another way of treating kidney stones is Ureteroscopy where a ureteroscope gets inserted into the urethra to break the stone with a laser. The procedure needs anesthesia and doesn’t require a hospital stay. Finally, Percutaneous nephrolithotomy is when an incision is made around the kidney area to drain all the urine and stones. The tubes remain attached for about 3 days where the patient need to stay at the hospital.